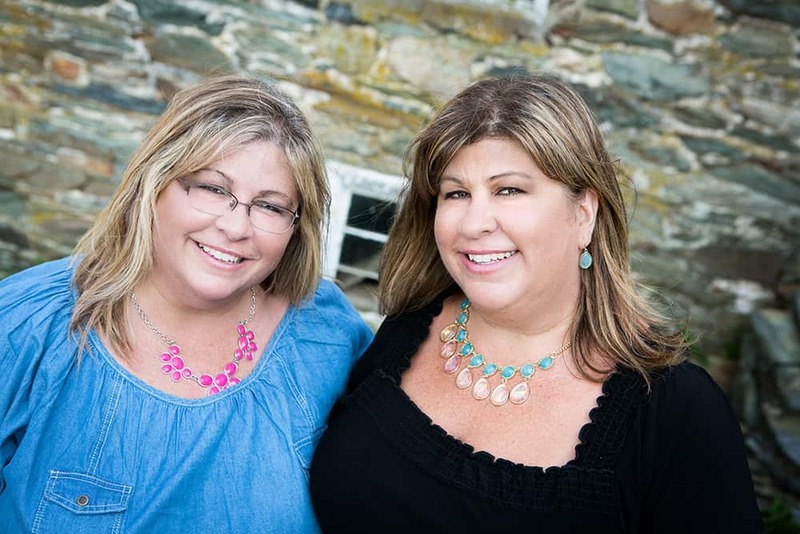 Here in Frederick County, we have a TON of amazing restaurants! So, when there is an opportunity to choose a restaurant to spend your money at, the choice can be pretty difficult. This isn’t such a bad problem to have. Here at Housewives of Frederick County, to date, we have written only one restaurant review (Ayse – written by yours truly). 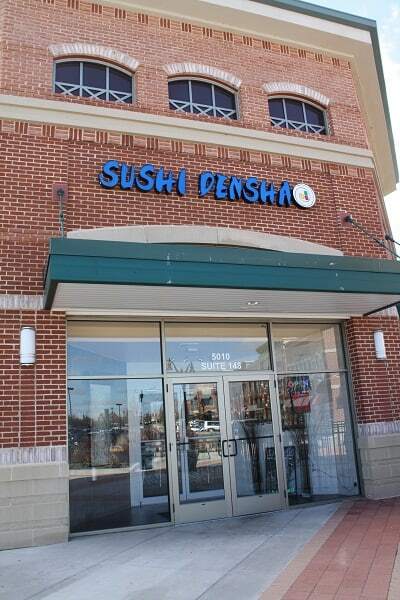 So, today, I am presenting our second restaurant review – Sushi Densha! Pam and I love to spend Fridays together whenever we can. We love to find excuses to do fun things together and turn them into blog posts. So, today we started at the outlets up in Hagerstown. It was my idea (ok, I kind of forced her to go shopping with me), so when we were done I let her (aren’t I so nice?) pick our lunch destination. 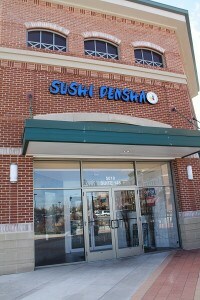 Pam LOVES Sushi Densha on Buckeystown Pike in the newer section of the Westview Promenade. I have enjoyed this restaurant the two times before today, but I wasn’t crazy for it like Pam has been – until today. We walk in and the waitress that greets us asks, “Are you here for the buffet?” We haven’t dined here when they’ve offered all-you-can-eat before, so this was such a pleasant surprise. I must admit, I am SO not a sushi connoisseur. But, I guess you could say that I am a sushi-connoisseur-wannabe? Just like wine, I feel like if you know what to order, it makes you appear just a little more sophisticated. 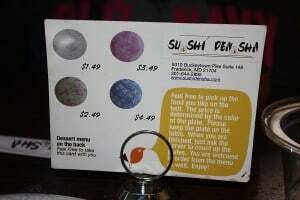 In my past visits at Sushi Densha I haven’t explored with the sushi because I just didn’t want to spend money on something that I may end up not liking. The set-up of Sushi Densha is such that they have tables around the periphery of the restaurant and then booths toward the center which are lined by a conveyor belt. In the center of all of this is the prep area which, today, consisted of 3-4 sushi chefs preparing the fresh sushi! So, if you sit at one of the booths, you get to view all of the different types of sushi that has been just prepared rolling by you on the conveyor belt. If you see something that you think you’d like, you simply take it off the conveyor belt and eat it! On days/times that they aren’t running the all-you-can-eat, the waiter/waitress figures out your total cost by adding up the plates you’ve accumulated from the conveyor belt. 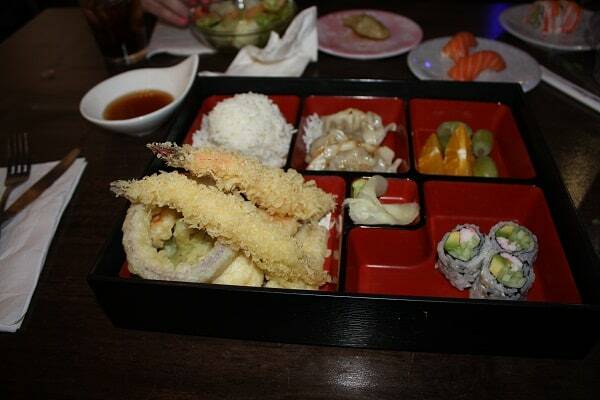 Each small plate usually contains 2 pieces of sushi. 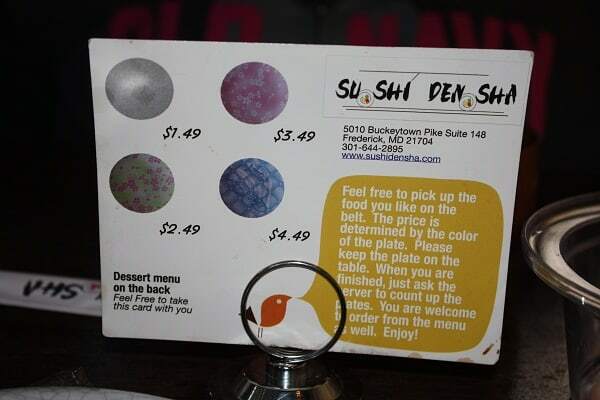 Sushi on a gray plate is $1.49, on a pink plate is $3.49, on a yellow plate is $2.49 and on a blue plate is $4.49. But, if you are lucky enough to dine during their all-you-can-eat (which the waitress told us is Monday-Friday from 11am-2pm), then you can pick anything you want, as much as you want, for $13.99. This is quite a deal. So, my verdict? Wow! I was so happy to be able to taste test the various types of sushi that they offer! Everything was fresh tasting and delicious! 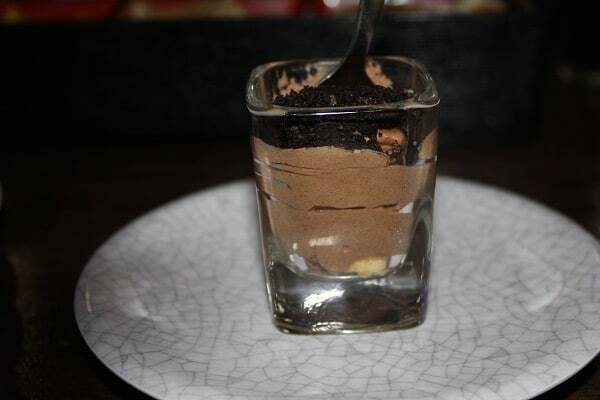 They even had little shot glass sized chocolate mousses on the belt too! You also get either soup or salad included in the all-you-can-eat. Pam opted for one of their Bento Boxes (3 pieces of California Roll, 3 pieces of gyoza (like a potsticker, dumpling-type item), fruits and a choice of miso soup, hot and sour soup or salad, along with whatever meat you choose – chicken teriyaki, beef teriyaki, salmon teriyaki, shrimp tempura, sushi and sashimi or shrimp teriyaki)). This is also amazing! The atmosphere of the restaurant is quite nice, yet casual enough that you don’t have to feel like you need to dress up – small, yet classy. 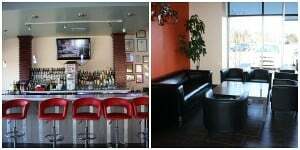 They also have a bar and a sitting area. 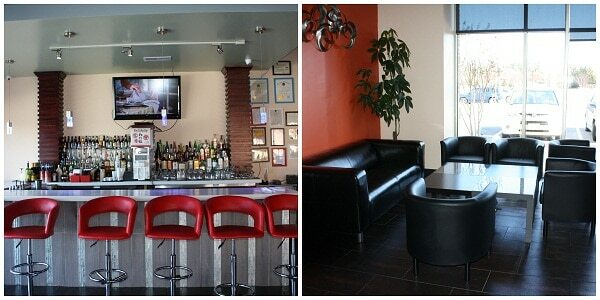 Evidently they have happy hour specials on drinks Monday-Thursday, 5pm-7pm in the bar area only. This sounds very different–never heard of food being delivered on a conveyor belt. I would try it just to witness that!!! If I hadn’t read your post, I would never have known about it! When are the three of us going????? I’ll buy!! This post makes me hungry. I’ve only visited Sushi Densha once but I can’t wait to go back. Thanks for the tip about the buffet! You’re welcome! It really is an amazing deal!